Have you ever laid in bed and became so engulfed in ultimate comfort that you literally felt like you were a part of your bed? If so, then you know the meaning behind our name, “B” your bed. The idea that bedding should feel so comfortable that it literally embodies you with coziness is the cornerstone of Byourbed. Byourbed’s mission is to bring you the best in bedding luxury, without the luxury cost. 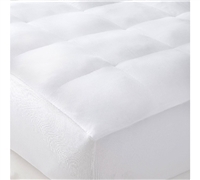 Our aim is to provide high quality, comfort inspired bedding at a price that makes you wonder “How’d they do that?” Our high-end quality is backed by Comfort Proof Tested Results. That’s right, Byourbed is the first to take bedding out of the dark ages (literally). No longer do you have to wonder if the bedding you purchased is the bedding you received. Comfort Proof® provides detailed, honest, and transparent information by sharing inspection results of the very bedding you are considering for your home. With Comfort Proof®, specifications and quality claims are verified. When shopping with Byourbed you not only know the dimensions, thread counts, fill rates, and materials are accurate because Byourbed has tested them, but for select items you actually get to view the independently tested reports for yourself. With the Comfort Proof embossed seal, you can be certain that the quality purchased is the quality received. What makes Byourbed different isn’t just the sharing of Comfort Proof Tested Results of bedding, but also the fact that our bedding is centered around giving you MORE. The Byourbed MORE starts with Byourbed being the leading manufacturer and retailer of Extra Long Bedding. Mattresses have gotten thicker and bed toppers more prevalent, yet comforters have remained the same size, causing your standard sized Queen comforters to be too small. At Byourbed, you won’t need to buy a King Comforter for your Queen bed. While a King Comforter could fit, it’s too much material and looks unkempt on a Queen Bed. The Byourbed solution for a perfect fit is our Queen XL Comforter. Byourbed’s Queen XL and complete line of Extra Long Comforters (Twin XL, Full XL, Queen XL, and King XL) provide a proper fit and maximum comfort no matter your mattress size. Beyond our signature XL Bedding, Byourbed also provides MORE through higher quality materials, increased fill rates for comforters, better stitching and an overall higher quality bedding construction. At Byourbed, we pride our commitment to high quality, comfortable bedding and pair it with low pricing, free shipping, flat rate hassle-free returns and premium customer service. Located in Buffalo, NY, Byourbed provides you with a USA based knowledgeable service team with an adjoining warehouse staffed to ship orders within 12-24 hours. Copyright © 2015 www.Byourbed.com All Rights Reserved. Developed by MAK Built with Volusion.